The meeting point for our Barcelona bike tour was deep in the Gothic Quarter. As we wandered through looking for our meeting point we passed churches, part of the Roman walls, we could see washing dangling from balconies and Catalan Independence flags flying proudly. We reached Greens bike shop, a specialist in Barcelona bike rental where we meet Edu from Steel Donkey Bike Tours. Edu is a Barcelona native and would be our Tour Guide on his Steel Donkey for the next 4 hours. 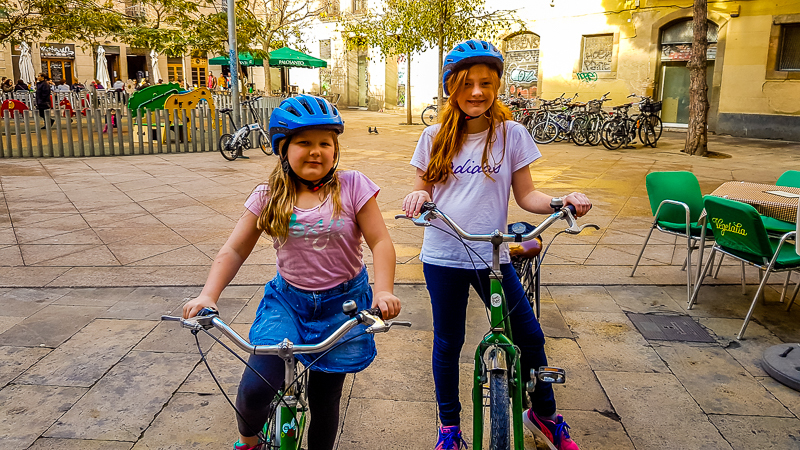 We all got our green bikes after some testing of heights for the kids and both the girls were supplied with helmets for their safety. 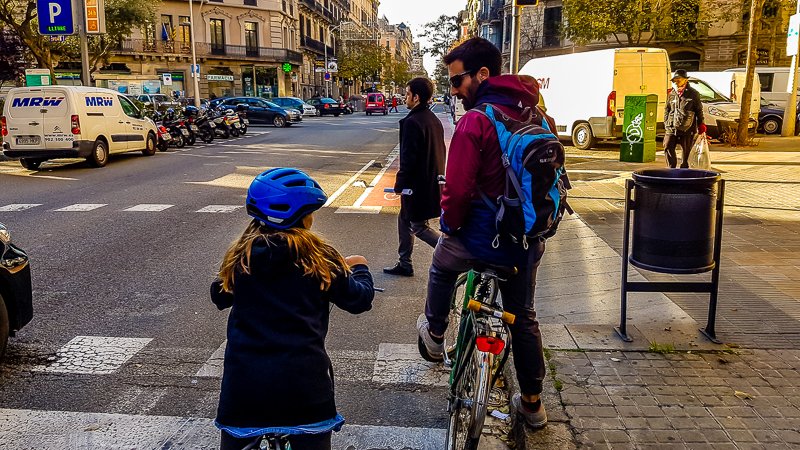 Edu explained that Barcelona, unlike many other cities, had not embraced a bike riding culture. Sure there were bike lanes and paths but this was no Amsterdam. Marley was very nervous as we started riding through the small streets. Our poor possum was intimidated by the people, scooters and delivery vehicles that zip around Bari Gothic and El Born. Edu helped put Marley at ease by listening to her and providing her with instructions whenever we stopped and as we rode. He answered all of her questions and we can guarantee there were plenty! Marley stayed glued to Edu’s back wheel for the next 4 hours which also put us at ease with her riding around a large city as it is not something we have done ourselves either. Edu explained the history of the Santa Maria Del Mar church. If you look closely inside their is an FC Barcelona logo as the club donated money to help restore it. We have personally been on the Barcelona hop on hop off bus tour and highly recommend it. See the fascinating city of Barcelona on a comfortable and convenient hop-on-hop-off bus tour. You’ll travel on open-top double-decker buses that cover 3 different routes. Your 1-day or 2-day ticket makes it possible see all that Barcelona has to offer! For more information and ticket booking click HERE. Did you know Eiffel came to Barcelona and proposed to build the Eiffel Tower and it was rejected by the powers that be in the city? A huge mistake I would say!. We headed up the busy streets on our bike tour of Barcelona until we reached one of the many neighbourhood markets that sell the best meat and produce in the city. Mercat de La Concepció is the type of place locals go, the type of place you develop a relationship with your butcher, fishmonger and greengrocer. We were given a 30-minute break to buy some lunch. We wondered around buying some small serves of traditional Catalan foods and then sat on a bench to eat them. There are toilets in the market here, just remember to have some 50 cent pieces with you as they cost money to use. Back on the Barcelona bike tour and we headed to the beaches of Barcelona. The new section that was created when the 1992 Olympic Games came to town. You see before the games Barcelona only attracted half a million visitors a year. The Games gave the city a chance to build, create and beautify this city. They needed this to attract visitors back after the Games had faded away into the past. Last year Barcelona Spain received 12 million visitors. Anyway back to the beach. This area was once an industrial area and fishing port. Edu told us it was once said that Barcelona had its back to to the beach. It’s now a great area with many sandy beaches restaurant and a promenade for strolling along. 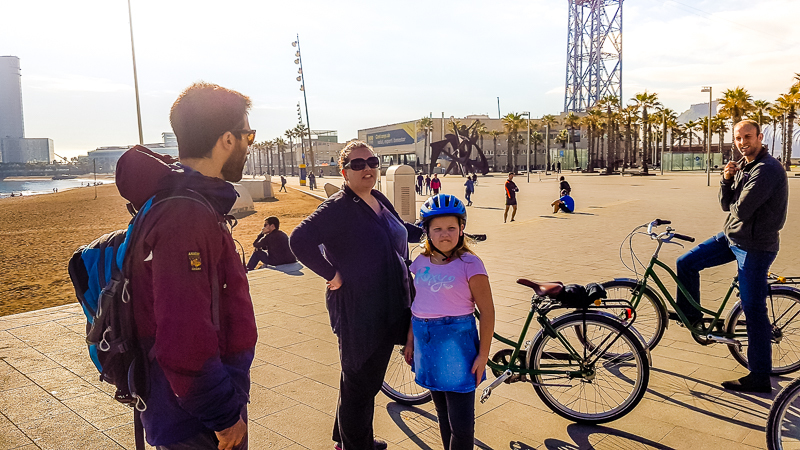 We all happily rode our bikes along the length of Barcelona’s man made beaches. Heading back to the Gothic Area we made one last stop at the Barcelona post office. Hostels in Barcelona can start from as little as 15€ Euro a night for a shared dorm room. I love biking around a city – it’s something I did when I first visited Washington, DC but I haven’t done it since and this post totally makes me want to try it again! I’ve always wanted to visit Barcelona, so I bet this is a wonderful way to take in the sights and sounds of the city! Also, I had no idea the Eiffel Tower was rejected here! So crazy how things turn out! This looks like a great tour, I’ll have to try it when I visit Barcelona someday. I’m a big fan of bike tours, it’s a great way to see a city and get some exercise. I just did my first bike tour in Toronto a few weeks ago and thought it was a great way to see a new city. It always helps to have a good guide of course, and I’m so glad Edu helped Marley feel comfortable. This looks like a really fun tour. What a great way to see Barcelona. I need a repeat trip to visit. Hey, Wyld family! Looks like your epic European adventure has been pretty fun so far! This bike tour sounds like a fantastic way to see Barcelona. In 4 hours, I imagine you covered quite a bit of ground and saw much more than you would have on a walking tour in that time frame. In the photo of Barcelonetta — is that a shopping mall? I visited Barcelona almost 14 years ago on a school trip, and I think we may have stopped in this area on our last day in the city. It looks very familiar to me. I’d love to get back to Barcelona (and Spain — or make that Europe in general) soon. I really enjoy biking and sightseeing tours, so I’ll keep Steel Donkey in mind. Gotta love that name! I don’t remember seeing this bike group when I was there, but will definitely look for it next time. I think biking is a great way to see a city and Barcelona is an amazing city! I have been to Barcelona only once but I loved the city so much I think it’s one of my favorite cities in Europe. I actually never thought about renting a bike and think that’s a great idea! Although I understand Marley it must have been overwhelming. How I wish I could bike. I have been trying to learn but I guess I am too old. Just got to vicariously do with you on your bike tour, though. What a great way to get a feel for the city. I’d love to do this as I like riding bikes. I’ve been to Spain, but not to Barcelona. It is on my list. The first time I saw pay toilets was in Ireland. It was strange to pay a dollar to use the bathroom. A good reminder that having actual money and not credit cards when you travel is always handy. Great way to explore Barcelona – we walked, and while it was a good excuse for some exercise, those hills had me huffing and puffing! Would have much rathered to have been on a bike!! I love taking tours too because there’s so much useful and fascinating info you miss out on otherwise. I had no idea the Eiffel Tower was originally proposed for here instead of France! Definite missed opportunity there!!! the Eiffel Tower in Barcelona was news to us as well . I love visiting a city by bike as you get such a different perspective. I can imagine it might be daunting for young children though. We cycled in Vietnam and it was crazy. Normal rules of the road did not apply and you often had to travel against traffic as traffic seems to travel in both directions on both sides of the street! Why, thank you very much, Mark! I was in Barcelona some months ago and I really wanted to hit the bike lanes, but just couldn’t find the time as it was my first time. I tried to fetch a red bike but I later learnt it was reserved for locals. So, I am definitely going to the explore the Steel Donkey website and plan accordingly next time (probably in June 2017). I just love Barcelona and I could easily live there, hehe! We love exploring cities on bikes! It’s a great way to see the sights as well as tire the kids out.